Did you know that Halloween is on a Friday this year? If you have kids, you’ll probably be able to detect the sarcasm in that question because you’ve probably been reminded of it at least three times this morning, before they went off to school, and you’ll be reminded again as soon as they get home. We understand that Halloween might not be your favorite holiday of the year. Considering the time that it takes a normal child to decide on a costume, as well as the drama that ensues when a friend picks out the same costume as they did, there have probably been years when you debated even handing out candy. But year after year, you weather the storm and maybe even end up with a little candy stash of your own. That’s why we’ve gathered up some healthy (and some “unhealthy”) creative, Halloween-themed breakfast creations for your little ones to wake up to on Halloween morning. Because this Halloween is going to be special. It’s going to go smoothly and there will be no temper tantrums. The kids will even go to bed on time. OK, maybe those are all pipe dreams, but at least they can’t say you didn’t make their Halloween special. 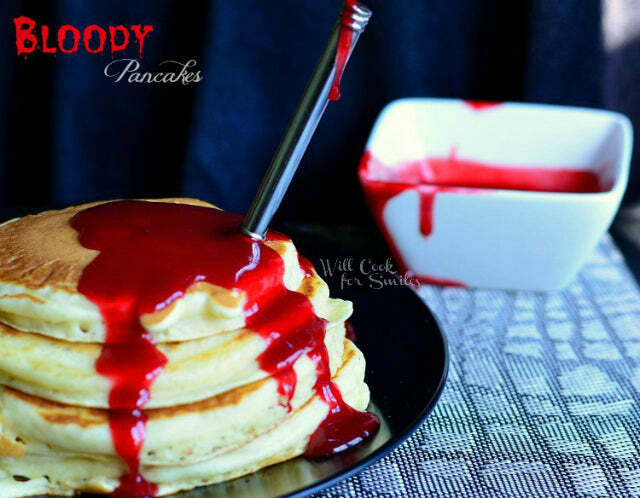 Lyuba from Will Cook for Smiles gives you a fabulous buttermilk pancake recipe as well as the chocolate-covered strawberry “blood” syrup. But we won’t judge you if you use instant boxed pancakes. The “blood” syrup consists of frozen strawberries, corn starch, sugar, and chocolate syrup. Surprisingly enough, the chocolate syrup turns the red of the strawberry juice into a deep, dark, blood red. Brilliant. Even though you could take the easy way out and use a boxed pancake recipe, we think Lyuba’s homemade pancakes look phenomenal. Get the creepy tutorial here. Considering that there will be classroom parties with candy, you might not want to give your little ones anything super sweet for breakfast, and we understand completely. This Witch’s Brew Breakfast Pudding is a healthy combination of spinach, bananas, and grapes along with a few other healthy ingredients like flax seed. The grapes make the big “bubbles” and adds a sweet kick to this super healthy breakfast. How can you possibly feel guilty about their huge Halloween candy haul with a breakfast like this? This witch’s brew might become a regular breakfast in your house. Get the healthy directions here. Here’s another awesome healthy breakfast that’s dairy-free, gluten-free, and vegan. It’s a purple-hued oatmeal monster with pecan hair, marshmallow eyes, and almond sliver teeth. 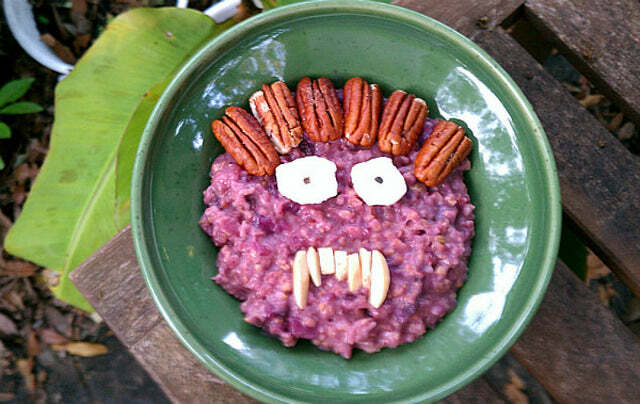 A purple sweet potato gives the oats a natural purple hue. It’s high in fiber and soy-free, so if you have a child with food allergies, this is a wonderful breakfast to start incorporating into their meals. Get the monstrous take on oatmeal here. 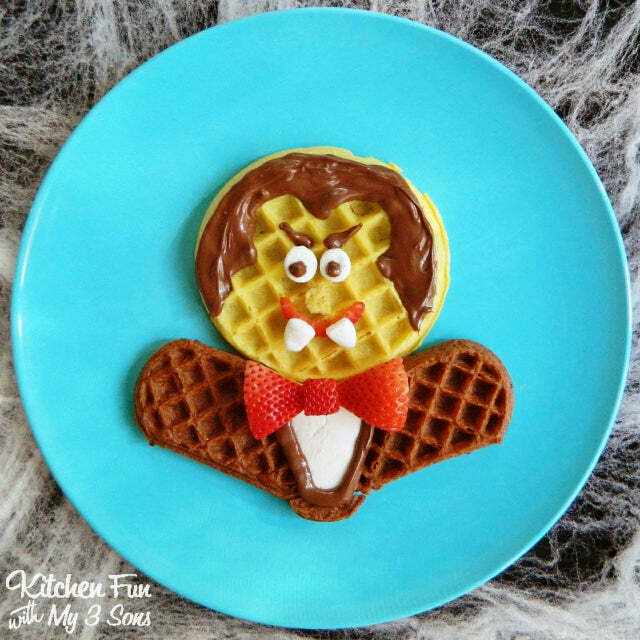 Jill from Kitchen Fun With My 3 Sons uses two types of waffles and Nutella to make this adorable Dracula waffle breakfast creation. Using a standard waffle for the head and two “wafflers” as the wings, she chose Nutella to decorate the face and hair and a cut-up strawberry for a cute bowtie. It might look time-consuming, but at least you only have to pop the waffles into the toaster to make the actual dish. You can prep the decorative accents while the waffles are cooking and you can be done in 10 minutes. Super easy, quick, and it will blow your kids away if they’re 10 or under. Check out these cute waffles here. There’s no baking or cooking involved in this easy Halloween breakfast tutorial. All you need is a bag of mini donuts and some sweet accents like licorice and candy sprinkles. Melt some chocolate and stick on the licorice legs and eyeballs, and you’re good to go. 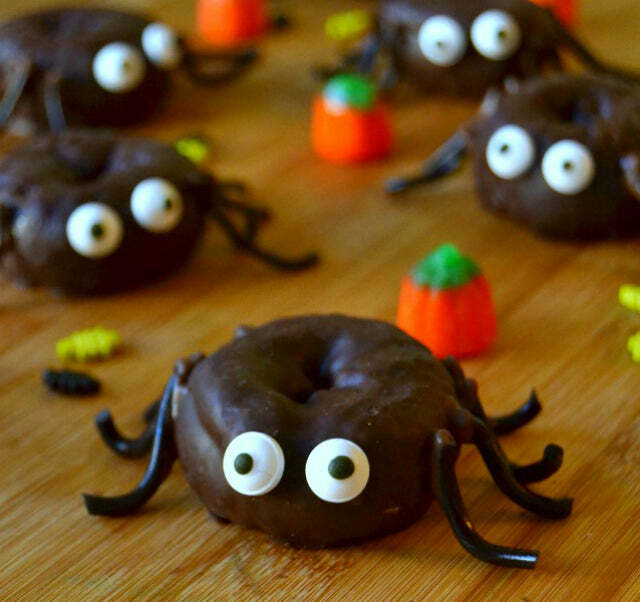 These would be fun for a Halloween party, or to send off with your kids for their classroom Halloween parties. Check out the adorable tutorial here. With four boys, Kara from The Joys of Boys knows how to make an entertaining meal. It’s a prerequisite when you have little boys. 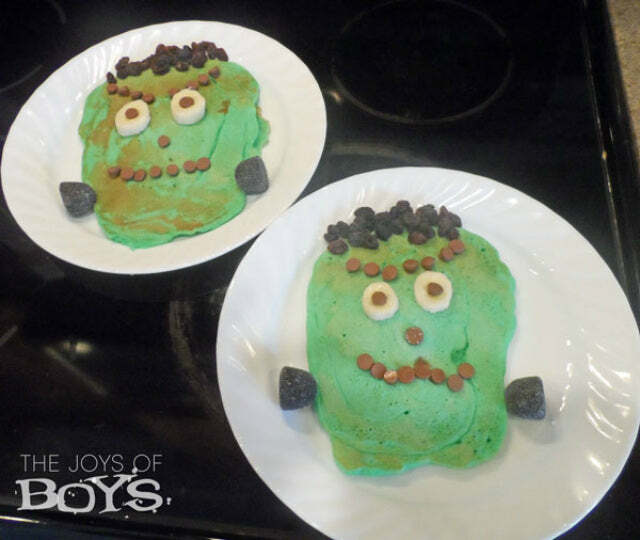 These cute Frankenstein pancakes are made with some green food coloring and chocolate chips for the face and black gumdrops for the bolts. Helpful tip: if you overcook the pancakes, the green will end up turning brown. That’s what happened to the Frankenstein in the back of the shot. So keep a close eye on your pancakes while they’re cooking, or add a little extra green food coloring. Leigh Anne from Your Home Based Mom demonstrates two ways to customize donuts in this googly-eye Halloween breakfast tutorial. Leigh Anne makes a monster-green icing for some regular donuts and then puts some googly eyes all over them. 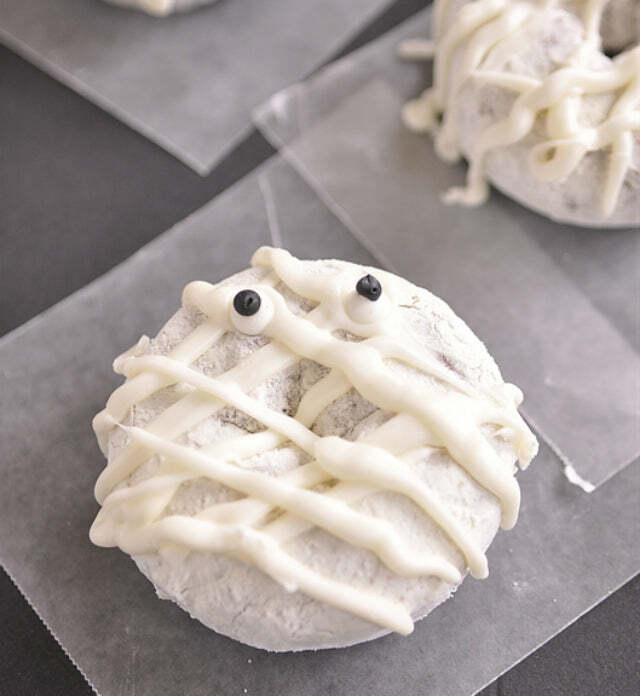 She also adds some striped white icing to a bag of powdered donuts (and googly eyes, of course) to make mummy donuts. Basically, she wants you to know that you can literally add googly eyes to any treat and turn it into an adorable monster. Make the eyes face different directions and they’ll go from being adorable to slightly creepy. Get the double donut tutorial here. You’re probably wondering how you can make a vegan French Toast without eggs. But Jess from So Fawned has a clever way around that, using banana, spinach, coconut milk, cinnamon, and maple syrup. Dip your pieces of bread into the “zombie mixture” and put it on the griddle. 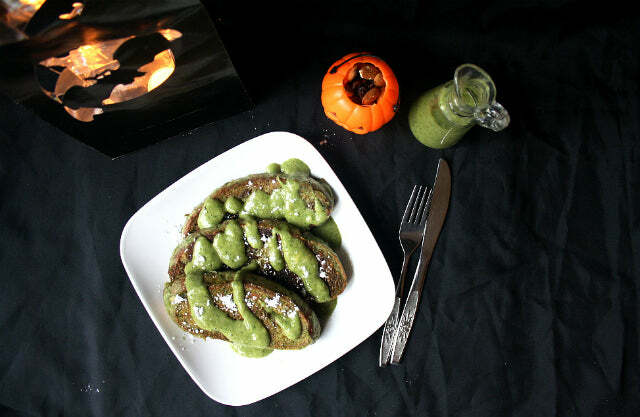 The result is a green, zombie-rific vegan French Toast. Kid-friendly, healthy, and made with fruits and veggies. They probably won’t even know that they’re eating something that’s good for them. Check out this super healthy breakfast treat here. Homemade pop-tarts just might be the most genius thing we’ve ever seen, and this recipe is on our list to make. Karyn from Pint Sized Baker knows that these things are made from straight sugar, but who cares? They’re delicious. She fills the middle of two pieces of pie crusts with candy corn pieces and bakes them in the oven. Then, she covers the top in a yellow, orange, and white sugar glaze for that extra kick of sugar. 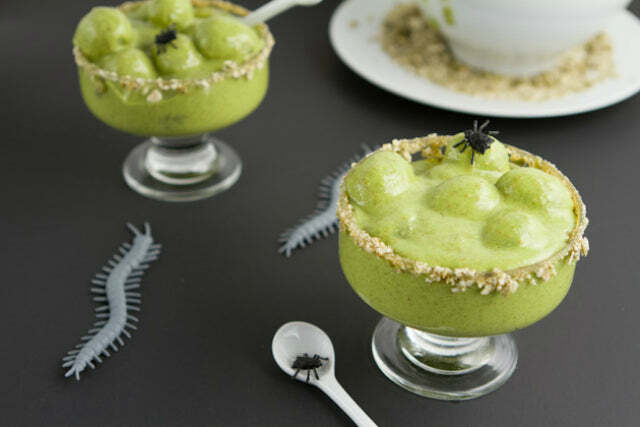 If you’re going to go all-out for Halloween, you can’t go wrong with this recipe. Find out how to make your own homemade Pop Tarts here. 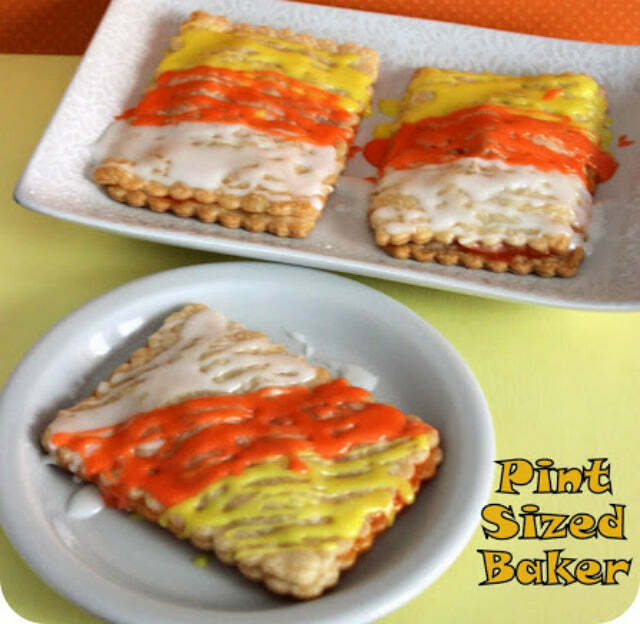 These jack-o-lantern homemade Pop Tarts are so cute, and they’re pretty easy to make too. Meghan from Ja Monkey found this recipe from a Weelicious cookbook and decided to try it for herself. You’ll need a pie crust (or other similar type of dough), some pumpkin puree, and some extra ingredients to sweeten it. Cut out a face, stick them in the oven for a few minutes, and use some homemade glaze over the top to give it that Pop Tart taste. Get another cool recipe for homemade Pop Tarts here. Here’s a super simple tutorial that will pack a punch on Halloween morning, as long as you have pumpkin butter on hand. If not, you can probably find a recipe for homemade pumpkin butter that will come in handy through the fall. 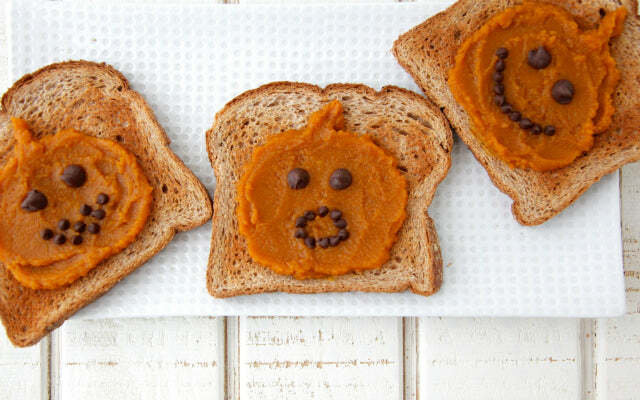 Simply toast your toast, add the pumpkin butter and spread it into the shape of a jack-o-lantern, and use mini chocolate chips to make his face. If you don’t have any pumpkin butter, you can probably execute this with some Nutella, or some regular butter with some food coloring. Get the simple tutorial here. If you don’t have a waffle maker, you might want to skip this one even though it’s pretty cute. Kelli from Random Thoughts of a Supermom has made almost every kind of waffle imaginable, and this candy corn creation is one of the most impressive. She starts by dyeing the batter two colors: yellow and orange. She leaves one section as is, since the top of the candy corn is white. 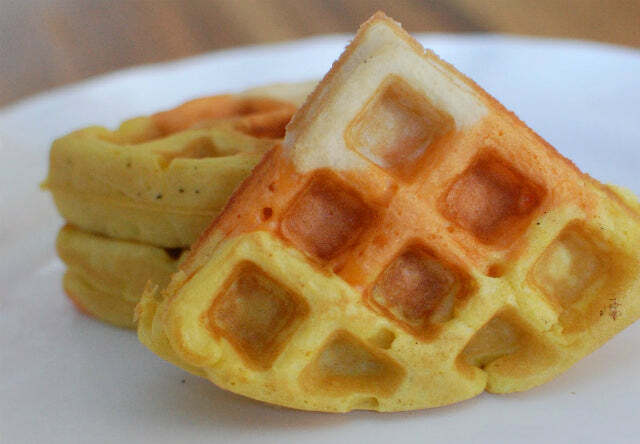 Press the griddle down and watch your ordinary waffle turn into an adorable candy corn piece. The circle will break off into 4 triangular pieces-how much more perfect can it get? Serve some of these to your little ones with some maple syrup and watch their eyes light up. Check out these super cute homemade waffles here. Kolaches are a Southern thing, but that doesn’t mean you can’t make your own. They’re essentially just meat wrapped in flaky bread. 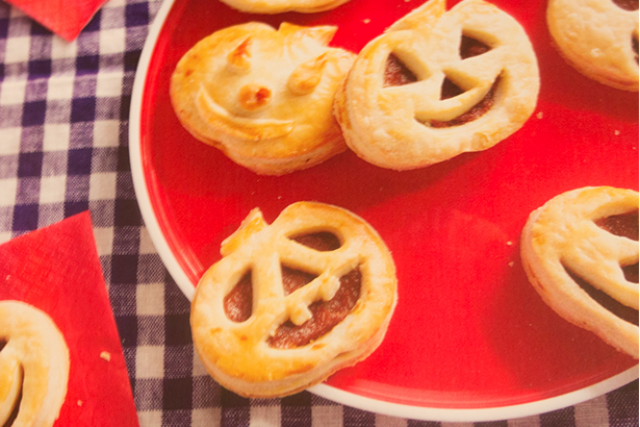 Katie from Chaos In The Kitchen gives you an easy way to make your own Halloween-themed kolaches. Get some small breakfast sausages and wrap them in some cut-up pastry rolls. Stuff them with cheese for an extra kick. 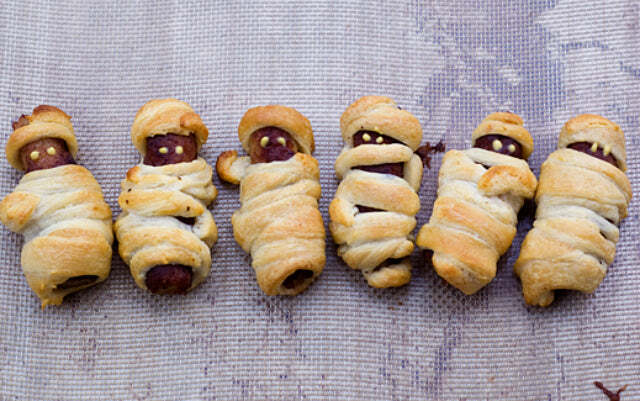 We also think these would be cute as h’ordeuvres for a Halloween party, or a fun snack to send off with your kids on Halloween.